The San Francisco Department of Aging and Adult Services (DAAS) and Self-Help for the Elderly, with funding by Supplement Nutrition Assistance Program Education (SNAP-Ed), has partnered with different agencies around the Bay Area to offer free Tai Chi classes for seniors. Tai Chi is a type of martial art that focuses on slow movements and breathing techniques. It is often called “meditation in motion” because it can be extremely effective at relieving stress and promoting inner peace in those who practice this form. The evidence-based Tai Chi for Arthritis and Fall Prevention program aims to reduce the risk of falls and injury in older adults, improve their fitness levels, and empower them to take control of their personal health through lifestyle changes. 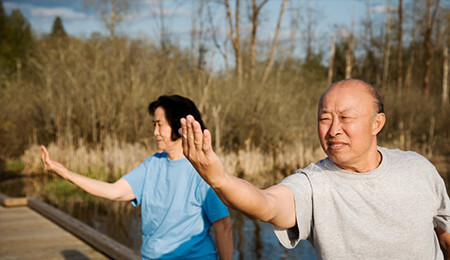 Tai Chi is a low impact, gentle form of exercise—perfect for seniors and those dealing with health or physical issues. By focusing on strategic breathing techniques and slow-motion exercises, Tai Chi is an effective way to improve your physical and mental health at the same time. The classes will meet for 6 weeks and are taught by certified Tai Chi trainers. Participants will learn a simplified Sun Style Tai Chi form, adapted by Dr. Paul Lam from the Tai Chi for Health Institute. We welcome seniors in the San Francisco Bay Area area to come join us for our new Tai Chi program.